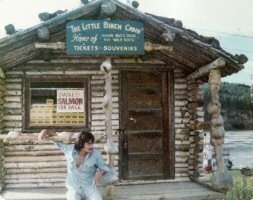 During my second summer (1975) in Dawson City Yukon—working nights as a Blackjack Dealer and days as a Riverboat Manager—I was also (as part of the latter role) Fishing Camp Assistant. There was no official Camp Cook per se, but I filled in whenever we had one of our famous salmon barbeques. In the accompanying photo, fisherman Tony Fritz is doing the honors while I stepped away to take the picture. I have done similar campfire or cabin cooking at various camps and the like over the years.